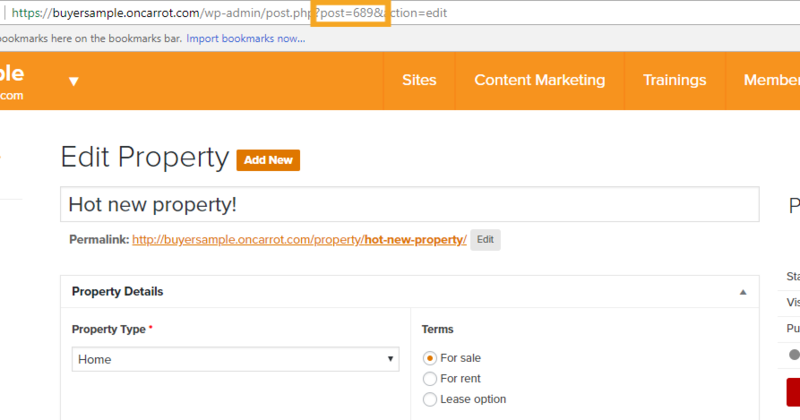 In addition to having a page devoted to displaying your properties, we’ve also created a short code for you to use to show properties within specific content areas on pages or posts of your choice. To use the short code, simply enter [properties] in the location on the page or post you’d like to have them display. Please Note: By default, the properties short code will display the 3 most recent properties you have entered. You can also customize the number of properties displayed by adding a count to the short code like this: [properties count=6] This will now display the 6 most recent properties. You can add a single property to a page based on the ID number of that property. To find this, you’ll view the URL while editing the property and look for the post ID. Then use the following code to insert your property (please note we are using the same ID number as the screenshot below showing you where this is located). Save and you’re done. If you remove that property or place it in draft mode, the specific property will not show on a page. It must be in public/published mode for visitors to see the property. If you need help on creating the property listing, check out our Listing Properties Guide.